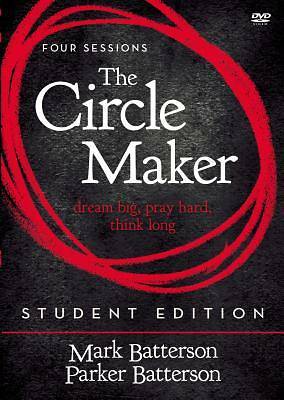 The Circle Maker Student Edition Video Study, a dynamic four-session video Bible study with pastor and bestselling author, Mark Batterson, and his son Parker, digs deep into the power of prayer. This DVD, featuring four 10-15 minute teaching sessions from Mark Batterson as well as introductions from Mark and his son, Parker, will spark thought and discussion. It is designed for use with the companion The Circle Maker Student Edition Participant Guide (sold separately). This powerful teaching will help students begin to identify dreams and future miracles they can draw prayer circles around. God, who still looks for circle makers whose bold prayers defy human convention and invoke divine intervention, is waiting for those prayers. Mark Batterson not only teaches about big dreams and bold prayers, he lives it. With ancient stories like that of the Jewish rabbi Honi, as well as reflections on modern day miracles as a result of prayer, The Circle Maker Student Edition Video STUDY will help students identify, discuss and put into practice the dreams and future miracles they need to draw circles around. Want it in two business days? Order by 4/18/2019 2:00:00 PM and choose Overnight shipping at checkout.